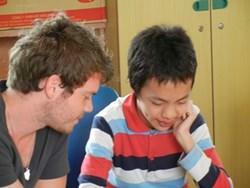 Projects Abroad offers voluntary placements in Speech Therapy to volunteers who are studying or have some experience or qualifications in this area. Your specific placement will depend upon your preferences and experience. Projects Abroad Speech Therapy volunteers may work in a hospital, rehabilitation centre, clinic or a school for disabled children. At some of the placements you will be expected to work independently. The Xa Dan Kindergarten is an integrated centre for children with hearing impairments. Here you will work either on a one-to-one basis, or in small groups of up to five children. Alternatively, you may be placed in the National Paediatric Hospital where the majority of children are suffering from Cerebral Palsy, congenital bone deformities or mental disabilities. You may also work at a rehabilitation centre that cares for disabled children who suffer from the legacy of the Vietnam War and other causes. Depending on the location of your placement you may stay with a local host family, or you may stay in a Projects Abroad rented volunteer house or guest house. You will be able to spend time experiencing the sights and sounds of the area with the other volunteers. To get the most out of this project, we encourage volunteers to sign up for the Vietnamese Language Course either before or during their placement. It is possible to join the speech therapy project at the rehabilitation centre for just two weeks, if you don’t have time to join us for longer, however, please be aware that you may not be able to make the same impact as someone volunteering for a longer period. Вы можете ознакомиться с детальной информацией о целях данного проекта здесь: Vietnam Medicine & Healthcare Management Plan.